If you're looking for a slice of Spanish heaven, where sun meets sea for a staggering 365 days a year, Denia is the place to be. We know you'll love it so much you'll want to buy a property in Denia, but for now, let's whet your appetite with what you can expect to find in this jewel on the Mediterranean coast. Before we hit the practicalities, we want to give you an insight in to why we've chosen to make Denia our home. Nestled on the east coast of Spain, with the Mediterranean gently lapping the surrounding sandy beaches, Denia is a location which retains an atmosphere of real Spain. Nonetheless, the people here are welcoming, and despite its relatively small size, the town has a buzzing cosmopolitan and exciting feel. Travellers are drawn here from every corner of the globe and with good reason. The climate here is exceptional. In winter, the feel is pleasant and in summer the temperatures tend to sit between 24°C and 32°C between May and September. Denia experiences nearly 3000 sunshine hours each year! That's really incredible and means you are almost guaranteed sunshine. Denia is in many ways a city in two parts which harmoniously blend together. The imposing castle dating from the 12th century towers over quaint typically Spanish streets. Yet wander down to the marina to experience contemporary Denia, with a vibrant and thriving atmosphere. Dotted throughout, and along the coast, are a wide selection of cafes, restaurants, shops and bars. Yet Denia is also supremely located for a traveller wishing to explore further afield. From here you can explore mountains, head to Alicante, or even hop on board a ferry to Ibiza and the other Balearic Islands. Visitors to Denia will typically fly in to either Alicante (86km) or Valencia (96km). Flights from the UK take around 2 ¼ hours. There is easy hire car available from the airports and the drive to Denia is about 1 hour. You can also take the train from Valencia to Denia if you wish. The beauty of Denia is that is situated within nearly 20 km of coastline, mostly characterised by gloriously sandy beaches and hide-away coves. Head north from the town and you'll discover the sandy beaches and warm shallow Mediterranean waters at beaches such as at Les Deveses, Punta del Rasout and Les Albaranes. To the south you'll discover a diver's heaven with the rockier coastline with a string of tiny rocky coves called Les Rotes. Many of the sandy beaches of the region have rightly been awarded Blue Flags and you'll find plenty of amenities including parasol and sun lounger hire. The marina in Denia has a staggering 546 moorings with associated services. This has led to the marina becoming the hub of modern life here in Denia. Along the coast here you'll find an incredible array of Spanish seaside life, including an impressive number of restaurants where of course there is a real focus on locally sourced seafood. The marina is also the place to discover the designer boutiques that draw visitors from far and wide. From here you can also charter boats, step aboard an excursion to Ibiza or Javea, or go on a fishing trip. With the focus on the Mediterranean feel of Denia, we shouldn't forget the marvellous backdrop. The Montgo mountain, sitting within its own natural park, separates Denia from nearby Javea. Not only does this allow for properties in the foothills to bask in spectacular views, but you can also explore this Spanish mountainous wilderness with a vast array of walks. The views will take your breath away. A trip to Spain isn't complete without lazy lunches overlooking the Med, or sampling tapas as the sun goes down. In Denia, the majority of restaurants line the promenade alongside the marina. You'll find a huge mixture of offerings here, with the local cuisine on offer being very typical of the wider Costa Blanca. Therefore expect to enjoy dishes from both in land, and of course a huge range of seafood. Fish, vegetables, fruit, olive oil and rice all feature highly on the menus here. Alongside fish dishes you can expect a choice of lamb, rabbit and local sausages. Your sweet tooth can be satisfied with Jijona ice cream, which is a nougat ice cream local to the area using the region's almonds. 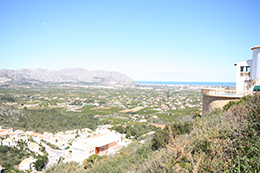 Furthermore, the region around Denia is building a reputation for its wine. The Jalon wine is becoming a firm favourite of both visitors and locals alike. You will not be short of things to do in Denia! Whether you want to relax in the pool at your villa, or explore further afield, you'll be satisfied. Activity enthusiasts are spoilt here. The waters of the Mediterranean offer a full complement of water sports including windsurfing, fishing, sailing, diving, snorkelling and rowing. Head to the surrounding mountainous areas to enjoy mountain-climbing, gliding, hiking and mountain biking. Golf-lovers will enjoy Denia's own 18-hole course close to the centre of town. 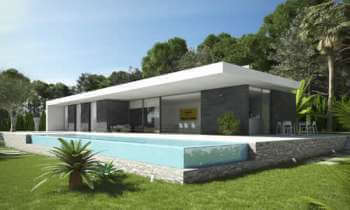 Nearby you'll also find further gold courses Moriara, Javea and Oliva. Within the town and the immediate area there are a huge number of available excursions. Perched in the middle of the town is the imposing castle, worth a visit for the views alone. The old town, Barrios Antiguos, is worthy of a gentle stroll as you explore. Visitors also enjoy ambling past the vibrant fisherman shacks near the beach promenade. The Baroque Iglesia de la Asuncion church at Plaza de la Constituçion is an awe-inspiring place to visit. There are also museums, other local sights and events. From Denia you can also easily enjoy a number of different day trips. You can take a boat to Ibiza or other Baleriac Islands. You can also reach Valencia comfortably within an hour and enjoy a day-trip to this city famed for its architecture and sights. Denia is waiting, ready to welcome you. Come and explore and we're sure you won't want to leave. If you want to make Denia your Spanish home then it's easier than you think. 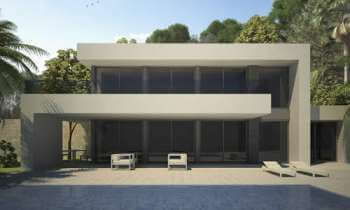 We work with people just like you to develop their very own home in Denia. So whilst you're visiting, come and see our show homes so that you can really imagine what Denia life is all about. Spain’s Northern Costa Blanca remains a favourite destination for holidays and second homes for people living all over Europe, thanks to its fabulous climate, short travel time and compatible culture.